Wow: is this the most expensive new TLD sale yet? The .Club domain name enters landrush tomorrow, and already the domain name is showing solid early results. Point in fact: English.club sold for $17,500. 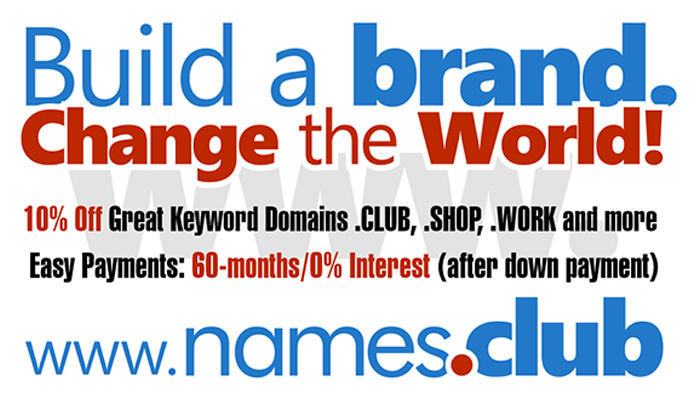 700 new gTLDs are launching with accredited Registrar 1&1, get your new .CLUB domain name now! Oil.Center was registered by a gentleman in Kuala Lumpur on 3/16/14 and is now on Sedo auctions with a day and a half left at 11,000 GBP. There is only one bid which looks like the owner received the bid and pushed it to auction on 3/24/14. Get Your New .CENTER Domain Extensions Today! Domain sales partnership comes to an end next week. Last November GoDaddy announced it was ending its syndication agreement with Sedo effective the end of March 2014. 700 new gTLDs are launching with accredited Registrar 1&1, Get Your New Domain Extensions Today! Get Your New Domain Extensions Today! I had hoped to find some GTLD inspiration in order to find a reason to give Frank Schilling’s just launched Uniregistry a try. According to Frank, it’s a game changing solution for a registrar. Some have said that is a bold statement and one that they can’t necessarily at this point agree with. Frank has commented on some blogs and said that some new features will be rolling out soon, but in many ways I can already agree with him, this is a game changing solution at launch. With the 2014 T.R.A.F.F.I.C West just two months away, show co-founder Rick Schwartz sent a letter out to previous attendees over the weekend with an update on plans for the big event May 28-31 at the Bellagio Hotel in Las Vegas. I couldn’t help miss the registrations by a organization out of Los Alamitos, CA named Viva Las Vegas who wound up getting a great domain in LasVegas.email, but went after and got domain names matching some trademarked and well known companies. Get Your New .EMAIL Domain Name Today! MACAU – March 25, 2014 – TLD Registry Ltd and Sedo, the world’s largest domain marketplace and monetization provider, today announced that the first premium domain name auction of new Chinese character gTLDs has raised US$182,000 from 33 auction lot sales. Bidders in the room and around the world paid between US$2,000 and US$25,388 for valuable Chinese character domain names in the Dot Chinese Online (.在线) and Dot Chinese Website (.中文网) TLDs. The hybrid live and online auction was staged in the Galaxy Macau’s “China Rouge” private member’s club and was simultaneously held live on Sedo’s online auction platform. Veteran and first-time domain name investors participated in and won auctions for domain names as diverse as “games.online” (游戏.在线) for $25,388, “casino.online” (赌场.在线) for 25,000, “realestate.online” (房地产.在线) for $16,000, “rent.online” (租赁.在线) for $15,500 and “bitcoin.online” (比特币.在线) for $14,388. In addition to the domain names sold at the live auction, many investors requested access to additional premium domain names, with some requesting portfolios of hundreds of premium domains in the Dot Chinese Online and Dot Chinese Website registries. China's central government is also backing the adoption of the new TLDs, introducing a new national policy on March 3, 2014 which mandates the use of Chinese domain names for all Chinese government websites. The 30-day Landrush period of Dot Chinese Online and Dot Chinese Website concludes on April 24, 2014, with the TLDs’ General Availability beginning on April 28, 2014. Domain names in Dot Chinese Online and Dot Chinese Website are unrestricted and available from a worldwide registrar network. The auction event was sponsored by .CLUB Domains and Afilias. (.在线) and Dot Chinese Website (.中文网). TLD Registry Ltd was founded by Finnish internet entrepreneurs, is incorporated in Ireland, and employs expert personnel and domain name industry veterans in Beijing, Hong Kong, Helsinki, New York City, Austin and Oslo. TLD Registry’s principal investor is Finland’s Vision+ Fund in addition to business angels. Sedo is the leading domain marketplace and monetization provider worldwide. Headquartered in Cologne, Germany and with offices in London, England and Boston, USA, Sedo has assembled the world’s largest database of domain names for sale with more than 18 million listings. The success of Sedo's model has attracted a client base of more than 2 million domain professionals in 180 countries worldwide. The company’s support team speaks 23 languages natively while its award-winning interactive marketplace seamlessly services client needs in six different languages. Sedo also has a full suite of services available for new gTLD applicants, including premium auctions in all application phases, marketing support, pricing, consulting and brokerage services to reach domain buyers globally. With more than 13 years of experience, Sedo is trusted by organizations and individuals around the globe as neutral partner for buying, selling and parking domains. Nat Cohen traveled to Geneva to learn more about the current state of UDRP. Here’s what he learned. In what was an interesting way to follow an auction, Sedo concluded their Macau auction this morning and they were updating people on Twitter as the auction ran. They actually set up a Twitter handle for the auction, @twitter.com/macauauction The account had 20 followers and they made close to 400 tweets. Click on the link and you can follow all the bidding action as it was tweeted live. The domain name was auctioned off by Godaddy.com who had multiple applications for the domain on the 4th day of registrations, which is part of Donuts Early Access program (EAP). Get Your New .PHOTOS Today! Frank Schilling’s domain name registrar Uniregistry is due to launch this week (likely Monday) and Domain Name Wire took an early look over the weekend. The exactly total of priced domain names was $3,327,525,422. Get new domain names from Uniregistry Today! As someone who frequently buys domain names in private and who prefers to quickly re-sell domain acquisitions, the primary issue I thought about when I read this news is the implication of what could potentially happen if the original buyer had already flipped one of the domain names, and a domain name was retrieved from the account of an aftermarket buyer. How Will The New gTLDs Change The Internet? I see three fundamental changes happening right now and wanted to bounce these off of all of you to get your feedback. Buying domain names that aren’t worth anything to another party is a quick way to deplete a bank account. There is an endless supply of domain names to buy and register, and knowing what to buy is the most challenging aspect of the domain investing learning curve. Like most domainers, I’ve been watching and reading about the new gTLDs, also known as general top-level domain names or new domain extensions, for over a year now, following TheDomains.com, Rick Schwartz, Morgan Linton, and other domainers. I’ve also followed GoDaddy’s new extensions promotion as well as 1And1.com’s new gTLD promotional commercial. Domain name investor pays top dollar for a .tips domain name. A .tips domain names has sold for $8,200 at GoDaddy. I haven’t seen a single visionary amongst the domainer community. Not a game changer in the bunch. If in 1970 you foresaw the internet opening up for commerce and prepared for that event..you could be a visionary. If you noticed early on that there were things happening in this interweb thing, jumped on and did well, that makes you an entrepreneur not a visionary. If you saw something being done and did it better, that’s not a game changer, that’s an improvement. According to ICANN, the Uniform Rapid Suspension System is a rights protection mechanism that complements the existing Uniform Domain-Name Dispute Resolution Policy (UDRP) by offering a lower-cost, faster path to relief for rights holders experiencing the most clear-cut cases of infringement. I don’t have plans to do so yet, but I will most likely purchase a few or several more new gTLD domain names in the near future as interesting roll outs occur. Part-owner of NameJet acquires competing service SnapNames.